True health is total health. One aspect of total health is reducing the toxins in your environment. One of the best all-natural cleaners is white vinegar as it is non-toxic and inexpensive. It can be used to clean almost anything! For general cleaner mix half water, half white vinegar and a few drops off essential if you want a scented cleaner. To mop your floors, we use the same mixture. It is safe for kids and pets too! Another simple way to create a healthier home is to remove two common sources of chemicals from your laundry room -- fabric softener and dryer sheets. 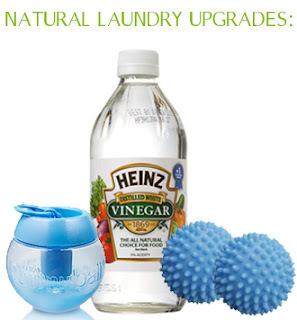 To reduce toxins in your laundry, replace dryer sheets with dryer balls. Plastic dryer balls can be found at many home good stores, but wool dryer balls are your best option. They help reduce drying time (saving money) and help soften clothes too. To find wool dryer balls locally, visit Sweet Peach Baby Boutique in Bay City, Mich.
Also, try swapping out fabric softener for white vinegar. Fill a Downy Ball with white vinegar and throw in the wash on top of the laundry. It works great, is a natural antibacterial cleaner and fabric softener. And it doesn't leave your laundry smelling like vinegar. Incorporate some of these natural spring cleaning tips for a healthier home!